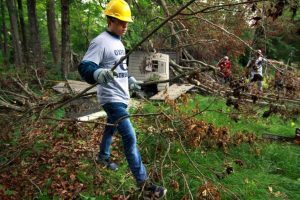 Justin Bizzotto and his Oxford football teammates chipped in to help after devastating storms. Christian Abraham – Hearst CT Media. It’s summertime (and finally feels like it). But there is no stopping the high school sports stories across the state and that means there is no stopping Linked Up. Keep tabs throughout the summer and check out this great collection of stories. From the Connecticut Post: Bravo to members of the Oxford football team that helped clean up after the devastating storms. From the Greenwich Time: Maggie O’Gorman was a star and leader for every season for the Greenwich athletics program. From the Norwich Bulletin: Griswold’s Kalli’Ana Botelho has the confidence and skills to excel on the track. From the Orlando Sentinel: Dr. James Andrews knows some things, and has some advice on preventing injury for young athletes. From GameTimeCT: It was a banner year on the lacrosse fields of New Fairfield. From CT Sports Now: The first year of the Vantage Cup honoring a complete athletics program went to Greenwich. From MileSplit.com: Fun idea showing which high school track coaches have the best athletic resumes. From the Waterbury Republican-American: In a countdown of the top stories of the season, Northwestern’s banner year was seventh. From GameTimeCT: Coming off a rare disappointing season, New Canaan football feels it has something to prove. From the Hartford Courant: New Britain’s valedictorian was as good on the field as in the classroom. From The Day of New London: Something needs to be done to protect high school sports from overaggressive parents. From the Hartford Courant: Not about high school sports, but a nice piece on dealing with athletic disappointment the right way. From GameTimeCT: Middletown boys and girls lacrosse programs are becoming varsity programs. From CIACsports.com: CAS-CIAC has appointed a new Executive Director. From CT Sports Now: Two experts join the show to break down the biggest stories of the 2017-18 season. From the New Britain Herald: Three Southington football players will be joining peers to take on Rhode Island. From NBC Connecticut: Canton girls lacrosse coach Sean Cole wants his team to embrace awesome. From Shore Publishing: Valley Regional baseball saw a three-win improvement under a first-year coach. From the Meriden Record Journal: Highlights from the paper’s exciting end-of-year award ceremony. From the Danbury News Times: New Milford football honored a former competitor in its Green & White game. From TheRudenReport.com: In a fun feature, a pair of Wilton seniors reflect on their high school careers.